The 31st annual Sounds of Summer Concert Series lineup features 18 performers in ’18! 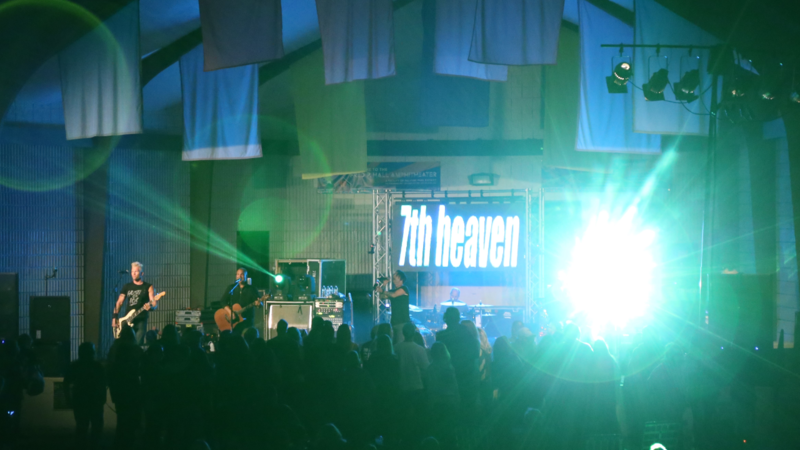 While the season will showcase several familiar acts, such as 7th Heaven and American English, a variety of new groups are scheduled, including José Valdes & the Mambo All Stars, The Nick Pontarelli Band, The Tenors 3, and Kevin Presbrey. All performances are free, so pack a picnic, pull up a lawn chair, and enjoy your summer music experience. The complete summer package includes Main Stage Concerts at the Fred P. Hall Amphitheater on Wednesdays and Fridays, Towne Square Spotlights on Thursdays, and Friday Family Picnic Concerts at Towne Square on Fridays. For a complete list of summer events, look for our Sounds of Summer program guide at Birchwood Recreation Center, Community Center, or Falcon Park Recreation Center later this month. Program guides will also be available at each concert throughout the summer. During Sounds of Summer Main Stage concerts, the Poolside Café will be open until 9:00pm and restroom facilities are available at the amphitheater. The Sounds of Summer Concert Series lineup features many talented groups, including these highlighted performers! Join Stolie for an interactive music and movement performance that gets kids thinking, guessing and singing about everything from spelling to animals, numbers, shapes and sounds while they move and shake to get all their wiggles out. Super Stolie shows you that it’s impossible to be bored when there’s music involved! These six outstanding musicians authentically recreate all your favorites from Fleetwood Mac, Peter Frampton, Tom Petty & The Heartbreakers, Heart, Boston, Steve Miller, Bad Company, Pat Benatar, The Cars, Elton John, and many other rock bands from the 70’s. Featuring male & female vocals, two outstanding guitarists and a blistering rhythm section, 1976 will take you back to the decade that changed rock music forever. Ukulele infused rootsy folk rock is one way of describing the vibration Kevin Presbrey is casting out there these days, but you could also very well say that his songs have a way of giving you that cozy feeling of being snuggled up by the fireplace in your favorite hooded sweatshirt. Embracing the influences of storytellers Jim Croce, Don McLean, and Van Morrison along with modern troubadours Ryan Adams and James Bay, Presbrey’s midwestern sound and personality is the vehicle for the stories he lives and shares. The Nick Pontarelli Band has made their mark on the Chicago music scene with a fresh take on all the greats, including Frank Sinatra, Dean Martin, Frankie Valli, Bobby Darin, Elvis, Neil Diamond and many more. Enjoy a night filled with your favorite songs performed the way you know and love them. Nick and the bands unique ability to entertain keeps the crowd excited and dancing all night long. The Tenors 3 are a professional trio of classically trained tenor vocalists performing a diverse musical landscape with a touch of comedy. Their repertoire encompasses Opera, Broadway, Operetta, Standards, Ethnic Favorites, Holiday Melodies, and much more, leaving you always with a song in your heart and a smile on your face. Relive the days of the Beatles! Using instruments identical to those used by the legendary group, this Palatine favorite has an uncanny ability to reproduce the vocal style and harmonies of the Beatles. Not only will they bring back fond memories for those who were there, but they bring to life the sounds of those who never had a chance to see the Fab Four live. This concert series has been made possible through the generous support of many local sponsors, including presenting sponsor Zeigler Automotive Schaumburg, as well as our gold sponsors Arlington International Race Course, Berkshire Hathaway Starck Real Estate – Sue Gould, Daily Herald Media Group, Home Smart Connect Real Estate, Just Peachy Photography, Kohring Electric, Nakfoor Orthodontics, Palatine Bank & Trust, Palatine Library, Palatine Township Senior Citizens Council, and Pizza Bella. For questions about the concert series, contact Cultural Arts Coordinator Ashley Schiavone at 847.496.6237 or aschiavone@palatineparks.org. Call the Weather Information Hotline at 847.705.5123, ext 431. For concert reminders and updates, download the new Palatine Park District mobile app available for iOS and Android to sign up for notifications.